@Moonjump05 wrote: Bendu is back, and he is kinda a jerk... I like it. Also, combining the Sith and Jedi holocrons for true knowledge? Yeah, I see what you did there. But please please, no Obi-wan. That doesn't need to be on Rebels, save it for a spin off so I don't have to watch it so that Obi-wan vs Maul round whatever doesn't completely overshadow the Rebels crew. Yeah it is very interesting that combining light side and dark side holocrons reveals knowledge and secrets, but it can also be very dangerous. It's interesting that they made it sound like a bad thing, too, combining the holocrons. I didn't see what was so bad about it, haha, but oh well. The idea that Rey's vision is similar to Maul and Ezra seeing with the two holocrons, @panki, is very interesting. I'm not so sure if the principles are quite the same, but it's interesting. For some reason I think the holocrons might be more precise, accurate and intentional, while Rey's vision might be more organic, inaccurate, and random. I really like the idea about Rey subconsciously asking a question, though. I wonder how Maul found out that merging holocrons could reveal things. Haha I'm with you, @Moonjump05 on being a little disappointed if Obi-Wan gets involved in Rebels. Maybe they'll make it work though, if that's where this story is going. And idk how Tatooine would fit into the story, since somehow the green-smoke stuff with Maul, Kanan, Sabine, and Ezra also has to be in the plot. If Maul's goal is to kill Obi-Wan or something, why would he detour from that? There is something more going on here I guess. Haha I'm so confused on how it will all work. And I still kind of hope he wasn't talking about Obi-Wan, actually, even though the general consensus is that he was talking about Obi-wan. I have this ridiculous hope that he was talking about his brother, Savage. Lol I could build a whole theory around that idea--it could involve the green smoke that came off of Savage when he died and the green smoke in the trailers and the idea that it would be a cool reversal of Savage finding and saving Maul after Maul "died." I know, I know, crack theory and wishful thinking, but, dang it, a story where Maul gets to find out his brother is actually alive and the go find and save him would make me cry. What I really want to know is what Maul meant by "hope" when he said it was what he wanted to see, too. That is an interesting observation....when he spoke about hope, he actually had a wistful expression on his face....Maul having a non-threatening expression was a novelty... So it could have been about Savage Opress....but it also could could be about finding family/belonging.... he lost his mother, his brother, the people he ruled (Mandalorians), his master betrayed him etc.....so maybe he is lost and really doesn't know what to do....maybe that is the guidance he sought? I actually felt sorry for Maul for a few seconds. I personally felt he saw Kenobi because Maul didn't find an answer to his question and piggy backed on Ezra's vision.....Ezra asked for a way to destroy the sith and was shown a planet with two suns etc....which means the vision showed him Tatooine, Luke etc.....going by that, Maul could very well have seen Obi-wan because he literally looked like he had seen a ghost when he said "he lives".... it also makes sense since all the jedi should be dead post order 66, especially the important ones. The connection between Ezra's vision and Rey's vision is because the merging of holocrons caused a vergence.....PH confirmed that a vergence was caused when Rey had her vision as well....and it was further confirmed when the Bendu said that this vergence allows one to see the future etc...and how it could cause chaos. 1. Maul's eyes turn orange when he is angry. 2. The Bendu seems to be a yoda-type spiritual guide for Kanan and Ezra. 4. Ezra gets a force vision like Rey (so does Maul)- so we understand a little more about the circumstances surrounding Rey's force vision. 5. The merging of holocrons causes a vergence. 6. Ezra sees Tatooine, Maul sees Kenobi. Maul is definitely going to search for Obi-wan. 7. 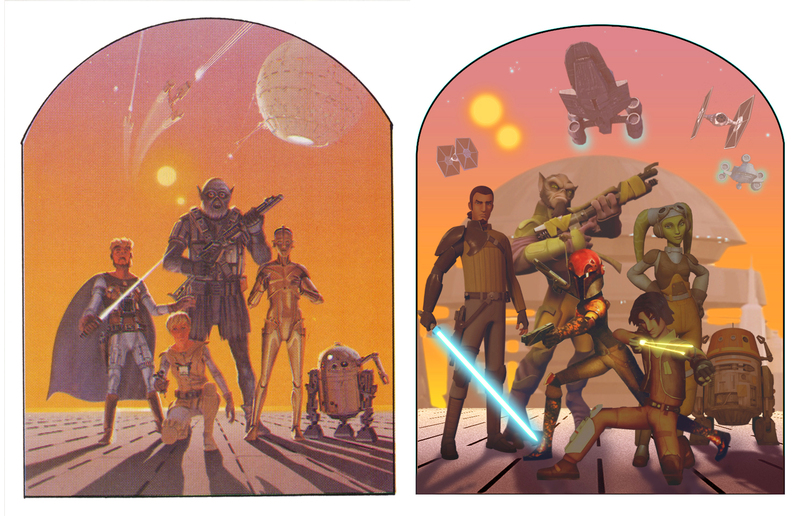 Kanan's vision returns briefly in the light of the two holocrons. Kanan has become a lot more strong in the force. 8. Maul makes a reference to his time ruling Mandalore to Sabine, foreshadowing Mandalorians appearing in this season. this might result in that short non-canon comic story where Maul first appeared with his robotic legs and Obi-Wan had to defend Luke against him being portrayed in the cartoon? Resulting in Maul's death once and for all? Because THAT WOULD BE AWESOME!!! I would actually love to see a final confrontation as well.....but I'm not sure Maul saw that Obi-wan is on Tatooine.... he lurched away at the end of the episode gasping that "he lives".... only Ezra saw the planet with two suns etc. before Kanan pulled him back....this means we're either getting a season finale confrontation (Maul's final battle deserves that at the very least though as @Moonjump05 said, it will overshadow the ghost crew) or they're giving us a novel/spin-off movie/comic series on Maul's hunt for Obi. I wonder what question Rey asked unconsciously when she held the lightsaber.....was she asking about her family? Or maybe where she belongs? Yep @Moonjump05 is right, it would overshadow the ghost crew. So what about it being the very last scene? Or maybe last episode? Taking place after each ghost crew character has had their arc completed and the audience has said their goodbyes to them? Or maybe it could be a stand-alone animated movie? With Maul focusing on finding Obi-Wan? Maybe if Ahsoka is alive she could play a part somehow? But I won't even mind the season 3 finale or a mid-season special of Rebels where Obi-wan and Maul meet again...I would only be disappointed if they depicted it in the Star Wars comic (Diary of old man Kenobi)....this is one of those fights where you don't want to miss any of the action. 2. Sabine rescues Wedge Antilles and another pilot named "Hobbie"..... Hobbie is the name of Derek Klivian, a rebel pilot in the OT who fights in ESB and subsequently in ROTJ. In legends, his best friend was Biggs Darklighter (Luke's friend) and he subsequently befriends Luke as well. 3. There is a small Poe and Finn reference when Wedge tells Sabine- 'I can fly anything', just as they escape the academy. 4. The big reveal- Agent Kallus is a rebel sympathiser, and might be the new fulcrum. I also wonder if there is going to be a love triangle between Ezra, Wedge and Sabine.....Ezra definitely has feelings for Sabine and Wedge mentioned in Aftermath how the Empire hurt the girl he loved- could this girl be Sabine? Also, could this be another reason for Ezra to fall to the dark side? I haven't watched the last episode yet. Will do that later in the week. I haven't watched the latter half of season 2 or any of season 3, but I don't really see why a protagonist "going dark" briefly is problematic or even unusual in children's storytelling. "For kids" doesn't = childish, and we're dealing with a franchise that is very much about beings who can channel positive and negative energy. Rebels was already starting to tackle many mature themes even in season 1 (I say "mature, but really, they were themes tons of American cartoons have already dealt with). So while I can't give an opinion narratively because I haven't seen enough of the show, I can definitely see Ezra going dark briefly. Aang from Avatar was often overcome by the raw spirit of the Avatar before he learned to control it, Danny Phantom was a villain in the future timeline of the story, Rex from Generator Rex had a "romance" with a villainess-turned-good and lost control of his powers pretty frequently, Teen Titans had Raven (who was half demon and definitely struggled constantly). And these are just children's "cartoons" from America. You could find similar examples in children's entertainment from other parts of the world (i.e. Naruto has the protagonist possessed by a demon spirit that was sealed within him as a baby). All of these series were definitely made with a young audience in mind (but also able to acknowledge an older audience by exploring deeper, darker themes). I wouldn't say any of them is particularly "too dark" for kids, and I would place Rebels in the category of "for everybody" entertainment. IMO it would be interesting to see Ezra be very tempted or even briefly lose control and become a villain. The seeds have been there for a long time, and if the writers choose to go there, so be it. a. Leaving the jedi order but being force users (like Ahsoka). b. Turning to the dark side. Now regarding leaving the jedi order but being like Ahsoka, we also have to be mindful that by the time of ANH, the Ghost crew are nowhere in sight.... they could still be somewhere in the background but it would be strange that two force users aren't playing a more prominent role in the rebellion....and Luke hasn't met them either in the movies or in the new canon materials (so a major plot hole if they take that route). This means they either left the rebellion for some reason or they are dead. Now here are some clues ....clue #1 in canon, Wedge Antilles has a great deal of anger against the Empire for hurting the girl he loved....infact, I don't think he gets into any relationship until he meets Norra Wexley years later. When he defected from the academy and joined the rebellion in the recent rebels episode, he had no such anger issues. This means the girl he loved could be part of the rebellion and he has yet to fall in love. Now clue #2...a combination of Sabine's symbol and the jedi symbol are adapted as the symbol of the rebellion. In legends, Starkiller Galen Marek's family crest is used as the symbol of the rebellion because he sacrificed his life to save Bail Organa and Mon Mothma in the early days of the rebellion. Could Sabine and some of the ghost crew (Kanan and/or Ezra) end up having a fate similar to Galen Marek? This would explain why the symbol would be adopted by the resistance. 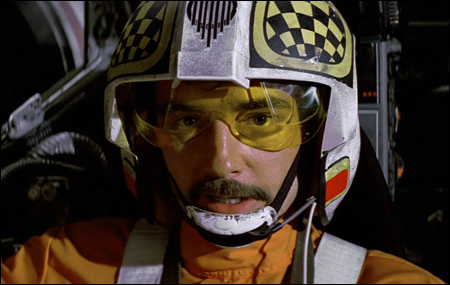 Clue #3....Biggs Darklighter wears a checkered design similar to Sabine's armor design on his helmet....could he be honoring her memory while taking the flight to destroy the death star? If I put clues #1 and #2 together, they point at Sabine being the girl Wedge loved....we also know that Ezra has feelings for Sabine from the time they first met. So if something bad happened to her, I think he will at the very least temporarily go to the dark side (unless Sabine and he die together). To sum things up, Ezra might have to either die or turn dark and leave the rebellion as he would be a super powerful jedi if he was still around, and it would end up undermining Luke being the new hope. So if Ezra does live at the end of the show, there is a strong chance he will fall to the dark side...and probably leave the rebellion, blaming them for what happened to the rest of the ghost crew. I sometimes have this head canon of an angry and older Ezra (played by BDT) who fell to the dark side but redeems himself in the ST.
SW Rebels has shown things like people's remains being used as bait, torture, blinding, possession, graphic death scenes etc.....I don't think it is a show meant only for kids, and they are not afraid to push the envelope when it comes to exploring dark themes. Having deaths and bad things happening in children shows is normal, but it's all about how you show it. I don't see SW Rebels as being really dark because the characters are still quite cartoony and there is usually some lighter moments after darker moments like Kanan saying to Ezra that he will always come back for Ezra after Ezra made some poor choices. Episodes do tend to end with a little lesson learned by one of the characters, which is to me actually quite typical for children shows. Sometimes the lesson is even, shall I say, a bit naive but surprisingly I find it endearing when in other shows it would get to my nerves so they must be doing something right. I am obviously talking about going full dark not being tempted. He's always been tempted. 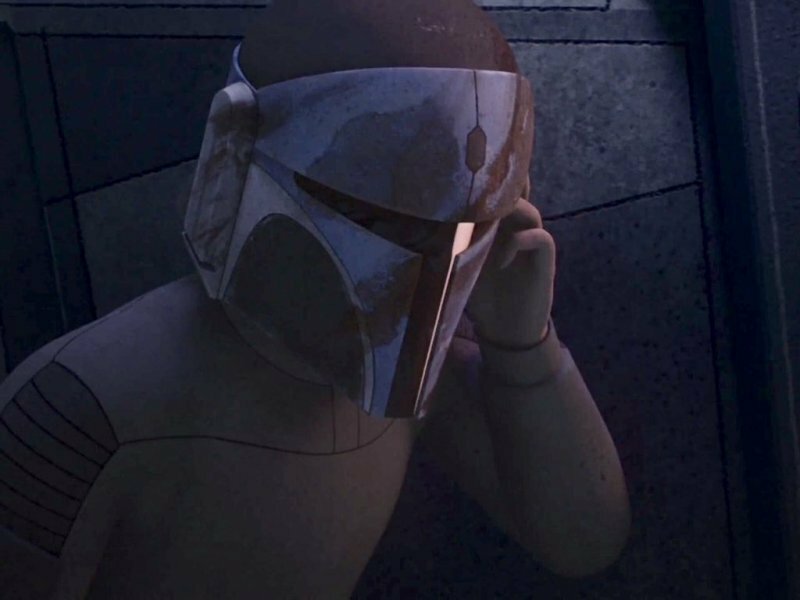 I don't know how Clone Wars ended but if Star Wars Rebels ends with Ezra being full dark, well I find that tough. We keep saying that SW is about hope. Ezra going full dark and the story ending there is not a story about hope unless they use another medium to tell his redemption. I agree that BDT looks strangely like an older Ezra. It struck me too the first time I saw SW Rebels, but I still have my doubts on characters crossing from cartoons to films. A difficult move especially when you realize that Disney seems to make no effort to render the show accessible to people outside of the US. So Ezra will be a stranger for a big share of the audience. Maybe they find a way to make it work. "Tension is a huge part of Star Wars and making it work. You need people to be on the edge of their seat and you have to believe -- just like I felt strongly in Clone Wars -- that not all of these characters will survive this." I think the very fact that they show a bunch of characters, allow you to get attached to them long enough and then kill many (if not all) of them itself differentiates it from regular children's shows.....not to mention Kanan's blinding which we literally see from his perspective when Maul puts a lightsaber to his eyes and we see red....at least I find the show pretty graphic for a regular children's show. Also, the style of animation is inspired by the concept art of Ralph Mc Qurrie for the OT....so they're being purist in their approach rather than cartoony. Again, this is a subjective view but I feel death is a lot worse than turning dark because turning dark and remaining alive still leaves the hope of redemption.... a lot of people feel that Ezra and Kanan being alive undermines Luke's hero's journey....maybe my view is colored by that but I'd rather see Ezra turn dark and later have a chance to redeem himself than to see him killed off to avoid plot holes. As for cartoon characters coming into movies....Saw Gerrera is a good example of a transition and I think they have hinted we'll see more cross overs in other movies. I mean, they have got an oscar winning actor to play a cartoon character, and this was an important cartoon character in his story arc in TCW, not just a side character. I'm still not sure if we'll see BDT playing Ezra but considering the strong resemblance, it would be a waste not to use the opportunity. It is a pity they're not promoting Rebels where you're based...I live outside the US (quite far off actually)...and we get Rebels on the Disney channel as well as Rebels related books and collectibles....funnily Rebels is promoted here much more than the movies when it comes to advertisements, promotions on products etc. Saw the last 3 episodes yesterday. I really wish the episodes were a a tad longer to linger a bit more in the emotional scenes. They're sometimes cut short to my taste. Kanan cracks me up sometimes. The droid : "Jedi, is this your padawan?" pointing at Ezra. Kanan : "Most of the time." A little snarky, are we? That one really made me laugh. Ezra and Kanan are really doing crazy things with the Force. If you compare to the OT it's like comparing the old series Batman and Nolan's Batman in terms of fighting styles. I shall hope we get some crazy stuff in VIII. We already had the blaster freeze in TFA so all hopes are high. I don't want a force feast with things flying around all the time but a couple of cool force moments. Speaking of twi'leks, Thrawn is an amazing character - I jumped to him because of his meeting with Hera. I read the book many years ago but can't remember much and I don't feel like reading again since the new canon one is coming out next year. I think they kept his cold strategic ways and love of arts and relics, right? Isn't it funny how some characters of canon stories have shown interest in relics? How old do you guys think he is? I don't know but I could see him in business with Snoke. They both seem to be the quietly creepy guys that are patiently moving the pieces on the chessboard but that, in spite of their placid ways, you don't want to see get angry. I guess that's not possible. I kind of wonder why they bring him back to life from Legends. By doing that, I fear they will give hope to Legends fans that other characters could come back. Like Mara Jade. I hope not because I don't want to see her being changed to fit into the new stories. While this is not something we'll find out in season 3, the new book on SW propaganda by PH reveals that Sabine Wren is alive after ROTJ.... She requests Mon Mothma's permission to create a Hera themed at work....this is probably the art work on Chandrila mentioned in Aftermath. The fate of the remaining ghost crew is unknown. I thought I could watch some Rebels tonight but there was no episode yesterday. What are the LF people doing? I want my share of Rebels on Monday evening. Maybe we'll get a reference to the Ghost crew in VIII. Would be cool to hear Leia mention them as a reference to heroism. @SanghaRen wrote: I thought I could watch some Rebels tonight but there was no episode yesterday. What are the LF people doing? I want my share of Rebels on Monday evening. I am unhappy about this as well......it seems they've postponed the episode to the 19th.... but they've promised it will be an episode where Ezra and Sabine work together as a team and it is supposed to be exciting...maybe this episode or a subsequent one has some RO spoiler they don't want revealed? Well, the latest episode was a typical episode with nothing spoilery, unless I missed something. I love how Admiral Thrawn is sending his full-of-himself officer - can't remember his name - alone in a ship. Go, Thrawn! I wonder what his final plan is and most of all, his agenda. What does he get out of destroying the Rebellion except please the Emperor. He likes to play it strategic, but is that all there is to it? @SanghaRen wrote: Well, the latest episode was a typical episode with nothing spoilery, unless I missed something. I love how Admiral Thrawn is sending his full-of-himself officer - can't remember his name - alone in a ship. Go, Thrawn! I wonder what his final plan is and most of all, his agenda. What does he get out of destroying the Rebellion except please the Emperor. He likes to play it strategic, but is that all there is to it? Yeah just seemed fun to me. I could not stop laughing about Mart Mattin (Matt Martin) and Gooti Terez (Andi Gutierrez). Those names are hilarious! :) it must be really fun for them to have characters named after them. And the other one, Jonner Jin, is named after the camera guy, John Harper. It was cool to see them get together at the end of Rebels Recon. Yeah just seemed fun to me. I could not stop laughing about Mart Mattin (Matt Martin) and Gooti Terez (Andi Gutierrez). Those names are hilarious! it must be really fun for them to have characters named after them. And the other one, Jonner Jin, is named after the camera guy, John Harper. It was cool to see them get together at the end of Rebels Recon. I've read that one reason Thrawn is more effective than other imperials because he isn't politically motivated. He isn't interested in climbing political ladders. He's all military, it seems. I do wonder about what other interest he has In everything other than his love of art, especially the art of war. I haven't read the Thrawn books, though (only part of the first one), so I don't really know anything. I wonder the same thing. But, yeah, go Thrawn! I think he is planning a really big attack and biding his time, discovering people's weaknesses and waiting for the right opportunity to strike....he knows Chaim Syndulla will give anything to save his daugher, that Hera is attached to her heritage, the whole ghost crew will risk their lives to save crew members and Sato's weakness is his nephew......quite a lot of useful information right there. Did anyone else watch the preview of the mid-season finale? Lots of TCW easter eggs including the Nightsister's pools on Dathomir, supercommando helmets and darksaber......and the big surprise was KENOBI written on a wall in blood (in Mandalorian) and a painting of Satine with her eyes and neck scratched off....Maul has truly gone mad....poor Ezra I wonder when we're seeing the inevitable duel with Obi-wan? I just realized that I have 2 episodes to watch still. I hope I can make it because one of my channels is not working anymore so hopefully the other one still does :/ Can't wait to go home now and watch. I think I'll scream so loud, if I can't see the episodes, that even Lucasfilm people will hear me. @SanghaRen ......lol.....I could identify the script as Mandalorian but couldn't read it so looked it up online. @BastilaBey ...its funny you should mention it....I have been thinking exactly the same thing....that what happened between Maul and Ezra could in some sense explain the connection between Rey and Kylo....their seeing the other person's memories and destiny etc....I have been wondering if this could be a way for Kylo to find Rey in Episode 8....maybe she even gets visions of him or hears his voice before he reaches Ahch-to? Finally saw episode 11. Holy cow. At the end of it I was sure that Rey is neither a Kenobi or even a nightsister. I am the opinion that if they expand something in a show, they will not do it in a forthcoming movie. I might have to eat my shirt on that one come episode VIII but I truly believe they want to do their own thing with the movie. They might get inspiration from existing mythology and have Easter eggs to please the fans but I don't see them placing big crumbles to the bigger story arc in TV shows. To me the fact that we might get OB1 in SW Rebels is the biggest proof that he won't play any major role in the ST. Yep, this is my bold statement now Until further information comes along to disprove it. I still don't see Ezra going dark. He's been flirting with the Dark Side but he has a lot of support from the team and that makes him strong to resist the appeal of the Dark Side. Unless there's a huge event happening - all his friends dying - making him turn would look unrealistic at that point. He seems to be more and more grounded. So what is this blade about? The one Sabine seems to know about? Speaking of visions, I still have this head canon of Rey having visions of young Ben while training. The nightsister option defintiely still exists because in the novel Aftermath, we do hear about the Nightsisters....which means they're still around after the battle of Endor.... also, the altar isn't the only place from which they manifested.....in Son of Dathomir, Mother Talzin emerges from a stone monolith on the planet and Ventress was immersed in a dark pool from which the voices of the Nightsister spirits could be heard....so they have many entry points on the planet to return to the world of the living and they're definitely returning at some point of time.....so I think they're still definitely in the running to be Rey's relatives. As the series progresses, I feel Kanan and Ezra might opt out of being jedi....Kanan's shift is foreshadowed in season two when he holds a red and blue lightsaber in his force visison.....and then his lightsaber looks almost violet in the visions and voices episodes when he gets possessed and sits on the altar.....as for Ezra, he tolds the dark saber and his lightsaber...and then he tells the Nightsisters he owes them one before tricking them and breaking their altar.....this makes me think either Kanan and Ezra are going to rebuild the Nightsisters or they're going to become the Knights of Ren.....or maybe something else guided by the Bendu...but definitely not jedi. The darksaber appeared last in TCW....the mandalorians took it from the jedi temple while raiding Coruscant in an ancient battle and it has become a symbol of kingship among Mandalorians.....so Sabine could potentially take up the title of Mandalore and unite the Mandalorians now that she possesses the darksaber...unless Maul tries to get it back, of course. Opting out of Jedi could be an option. Actually are they technically Jedi? Kanan did not finish his training, but he is following their ways of thinking. I can definitvely see the Nightsisters come back in SW Rebels. I think they fit right in the show. Honestly, I do hope that Kanan and Ezra do not turn into villains. Ezra has gone through a lot and resisted so to me it would really look at this point like a mere plot manipulation for the sake of getting a villain. Signs of darkness, then no, then full turn. A bit like Kylo: signs of darkness, signs of confusion and despair and then full turn -> er, nope. In the end, my view on SW Rebels is that it is meant to eventually connect to the OT and not to the ST in a direct manner. I can see Easter eggs but I can't imagine SW Rebels being heavily and directly connected to the ST. In my mind I can see Rian Johnson - because I know him so well, mind you - think about the movies, see some TFA material and just let his mind go all weird and crazy and come up with a story for VIII that is both very SW and not SW at the same time : SW next gen. Then the story group would go like "Not sure it fits with existing material..." and KK would say "Sh** up, I decide what fits or not". And weird and unexpected we'll get. It's wishful thinking from my side. Sabine will kick Maul's a*** if he comes close to the saber. Does this saber have special physical powers or does it just have the power of a symbol? I actually do agree with you that the big crumbs they throw might not lead to episode VIII....at least not until we reach the end of 2017 sometime......I actually don't see the Nightsisters being brought back anytime soon...if they return with Kanan and Ezra's help, it might be at the end of season 4 or 5....but I do feel the Nightsisters are linked to the time after Endor because they were specifically mentioned in the Aftermath novel (and we get the impression there are more than one of them around)...also, in legends, the Dathomirian witches play an important role, with Han and Leia's granddaughter Allana being a descendant of one of the witches from her mother's side....hence my feeling Rey is connected to them especially if Reylo happens....at least that is one aspect form legends I wouldn't mind seeing in canon. On a happy note, we know Chopper and Hera live to see ANH and Sabine is part of the rebel propaganda dept upto the battle of Endor....so this leaves the question of what happened to Zeb, Kanan and Ezra.....I think Kanan and Ezra might not turn to the dark side...but maybe they get disillusioned with the rebellion and just quit....considering how they are spending so much time with the Bendu who is neither dark nor light,maybe they will realise that the person meant to overthrow the sith is someone else and it isnt their place to interfere with the will of the force...and hence just walk away? I think the one character who might die is Zeb...maybe he and Kallus die together? I think the darksaber enhances the users powers...that is why Pre Vizsla could hold his own for a short while against Darth Maul....but obviously a really strong force user can outmatch the dark saber user so eventually Pre Vizsla was defeated and beheaded with the darksaber....hopefully Kanan and Ezra will train Sabine to use the darksaber so that she can use it to defend herself against Maul. Since Sabine is still around at the time of the battle of Endor, I am hoping she is alive at the time of the new Republic...some YouTube channels speculate we might see her in the ST briefly as a masked figure (the Mandalore rarely shows their face)...though I don't see it happening if Rey has to use the darksaber.